I think that yesterday we narrowly escaped a foot of snow falling because a lot of areas in Canada got pounded with snow while we had rain! 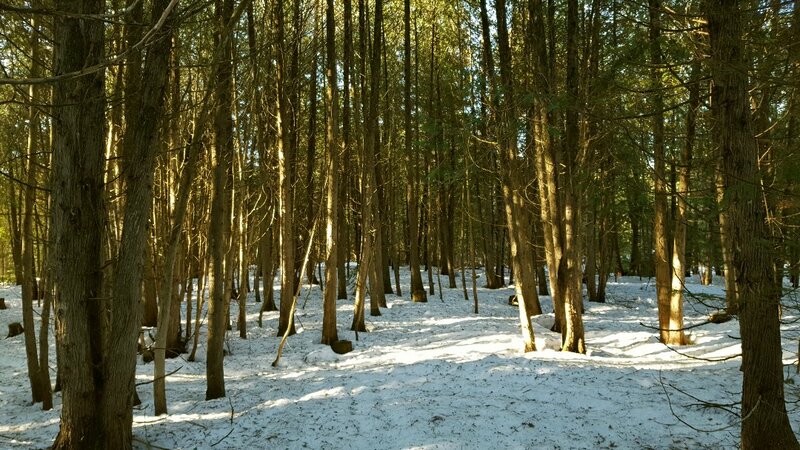 But...as you can see, the woods are still covered with a snowy white carpet. I tried to take the dogs in, but I kept sinking into puddles so we didn't get far. We stuck to the road just to be safe. I drove over to the other side of the river again this morning to walk them and we had no issues! Last night we had pizza for dinner. I tried two new pizzas I'd never made before. 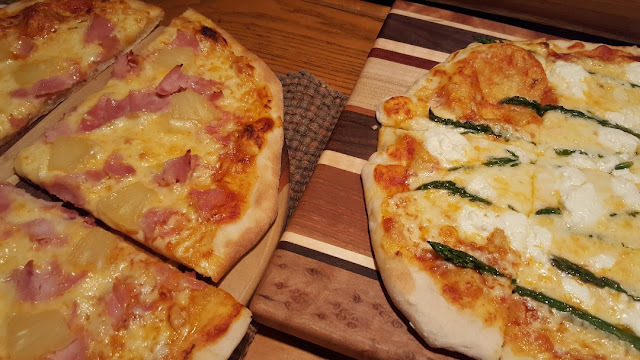 Hawaiian (with Mozz, ham and pineapple); and Goat cheese with asparagus. 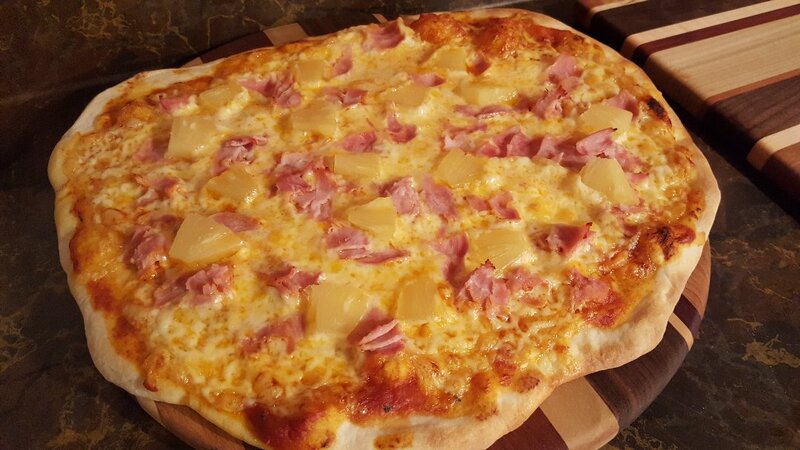 Alex liked the Hawaiian - I'm not big on pineapples. And we both LOVED the Goat cheese with asparagus! It has Mozzarella too. I've always been reluctant to "modernize" recipes...I'm a cheese-pizza lover! But I thought...why not try? Asparagus is in season right now and really inexpensive...plus it's the thin asparagus that I just go nutty over...so I went for a modern pizza. Well worth it! I still REFUSE to put lettuce on a pizza though! I'm not THAT modern!!! Alex put up the extra shelf in my sunny window so I could keep planting! I've added two pots of cilantro, a pot of thyme and a pot of oregano. I was a little behind in the labeling department, but I finally got my spinach and beets labelled! 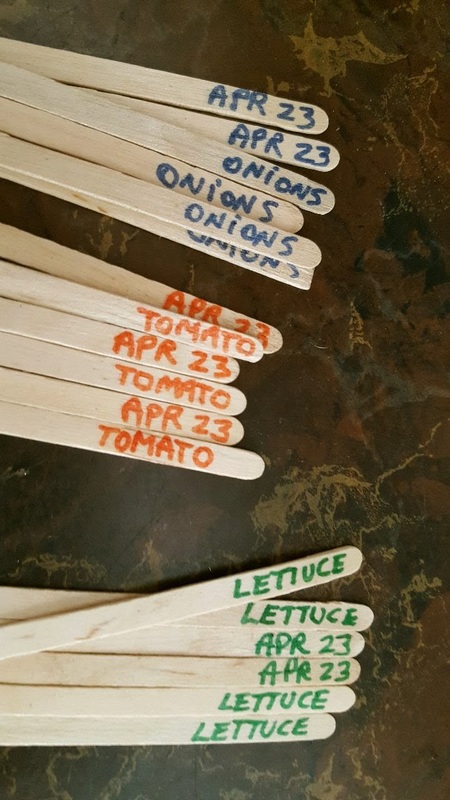 I decided what the heck, so I made labels for everything I planted this year so far. Alex was watching James Bond today, Goldfinger, and he called me up to see the glass that the ever-so-dashing (swoon) Sean Connery was sipping from. We are kind of cocktail glass fanatics...and I asked what he was drinking. Alex said "Mint Juleps"...so I got the bright idea that I NEEDED to grow mint for mint juleps lol...THUS...the latest seed order. I ordered mint, but I wanted to make the free shipping worth it, so I added some chamomile, rosemary (just in case my dead rosemary plant is actually dead) and some more chives. Okay, I VOW this time to stop ordering seeds....didn't I just say that last month??? Our weather is really warming up quickly. This week I'll be in the yard raking and cleaning up the areas where I want to put my containers. I'm also going to try to build a raised bed or two. In the next few weeks, we have to get my porch all screened in too before the bugs come out. It's going to be a really fun time for me, I just love being outside! Believe it or not, I already got chewed up by mosquitos the other night. Little buggers. Yum yum yum. I am also a fan of seafood on pizza. Pizza possibilities are so endless. We don't have a real italian pizza place here were I live ... so it is always homemade but sometines I miss real italian pizza. There is nothing better. 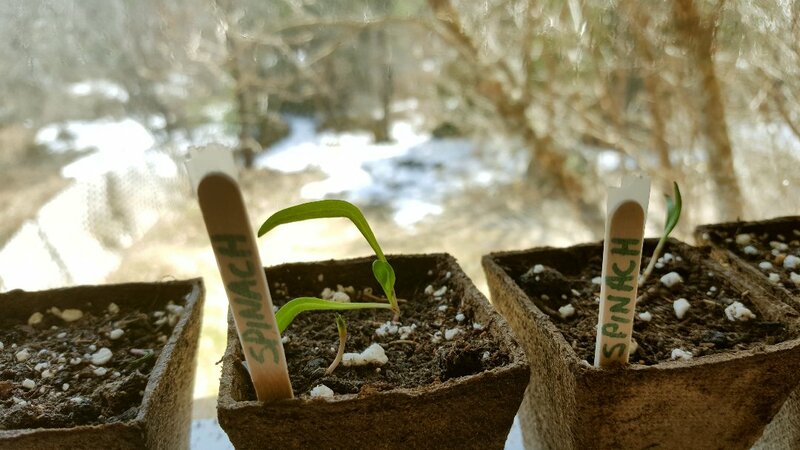 I started my seeds at the end of March and they all are doing well. I use a gardening tunnel in case Mother Nature brings back winter. I hope spring weather will come to you soon. you sound perfect one for farming as i can your love for nature ,plants and hard work. through your profile i know you want to buy some property for this purpose and i am wishing you BEST OF LUCK for it! to be honest i too avoid much experiments while cooking ,quite rarely . your try looks wonderful ,inviting and delicious. i liked you shelves ,they are so pretty and pots look lovely in order. wishing you all the best for you upcoming tasks related to gardening my friend. I never had a mint julip but there is mint growing wild all around our spring house, it likes areas near water but not right near water, must just need dampness. One day no snow! Saturday it was cold and cloudy here. Too cold to really enjoy working outdoors, but Sunday it was much nicer. Although I am feeling under the weather, we got work done. Those pizzas looks fantastic. Good luck with her herbs. I love mine. I can't put anything more outside until after Mother's Day (risk of frost). starting seeds certainly is addictive. when i first plant the seeds, it seems like i hardly have anything at all. and then they grow! my whole garage is being taken over by them! i give plants to all of my friends because i start so many. i've already started hardening them off. i doubt we will get anymore frost. Mmmm, mint juleps! Actually, I don't think I've ever had one, lol! Hi Baili :) Thank you! :) When I was in high school, they give you an aptitude test...I think that's what they're called. My "chosen profession" was farmer! But you know, I was fifteen years old and was embarrassed by the result and didn't tell anyone. If I'd only listened to the result, I'd be much further ahead than I am now because I was meant to be a farmer!! 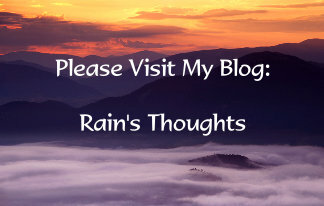 :) I do hope you get some rain soon! Hi Kristina :) I hope you heal fast. For me the last frost is usually Victoria Day, I think that's one week after your last frost risk. It's so tempting to start earlier, but I'm going to be patient! Hi Debra :) I've never had a mint julep either, it's with bourbon so it would probably quite sweet. I can't wait to try it with my own mint! Oh I say the more the better (for seeds) and you will love Veseys. I use them also and their catalogues are very nice to look at and easy to navigate! Those pizzas look amazing! I do like pineapple on pizza and am not too fussy with meat on my pizza (I have a hard time eating meat most days) so I usually stick to mushrooms, onions, pineapple, etc. No peppers for me tho, my stomach does not like them. But lettuce!?! I have never heard of that on pizza but I can't imagine it would be good - would it not wilt to the point of chewy or stringy? That's a choking potential right there (sorry...my EMS background - always on alert for potential disasters). Mmmmmm mint juleps! The best one I had was in New Orleans...so, so good! And I am not a big alcohol drinker but they were very refreshing! :) Mint is so easy peasy to grow too! Just make sure you keep it contained otherwise you will curse the day you planted it. It can be very invasive. I hope it warms up nice and lovely for you so you can get outside and enjoy!!! Hi Susan :)) I got distracted by all that stuff this morning too! It's so nice being out again! The lettuce on pizza...it's a big trend lately that recipe writers love. They'll just try to make it so different that to me anyway, it's overkill. I have a cookbook called Pizza Night and 3/4 of the pizzas inside are kind of useless to me. She wrote one called a "Cesar Salad Pizza". You bake the crust, put Cesar dressing, Parm and Romaine and heat it up...to me that's just grosse. I'll take a Cesar salad with a bianca pizza on the side please!!! I hope your weather gets better soon! It's too late in April for snow! Glad you are having some Spring weather and sunshine! 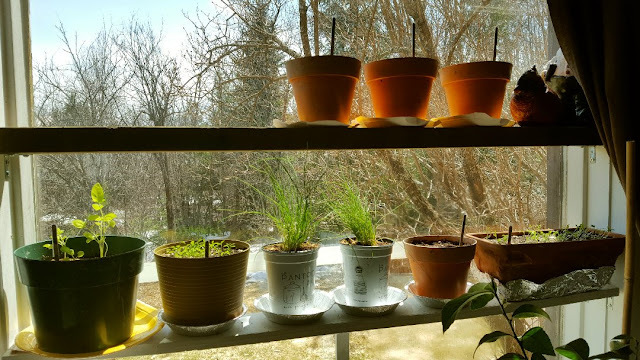 I love your seed shelves and I've always wanted some on a window...I should do that! Those pizzas look fantastic....I still have to make your dough and try freezing them. 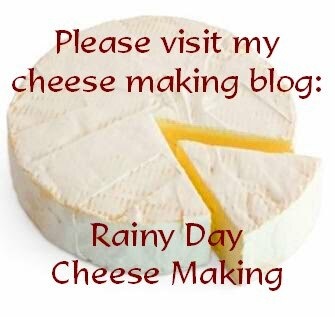 It would be great for me and I do love me some goat cheese! LOL! BTW...Sean Connery hits his wife and thinks women need it every once in awhile....he may be handsome but he's a scum! It was in an interview he did years ago. Hi Sam :)) Every time I go back to my pizza posts I get a new craving lol...goat cheese on pizza tastes really REALLY good with some Mozzarella. 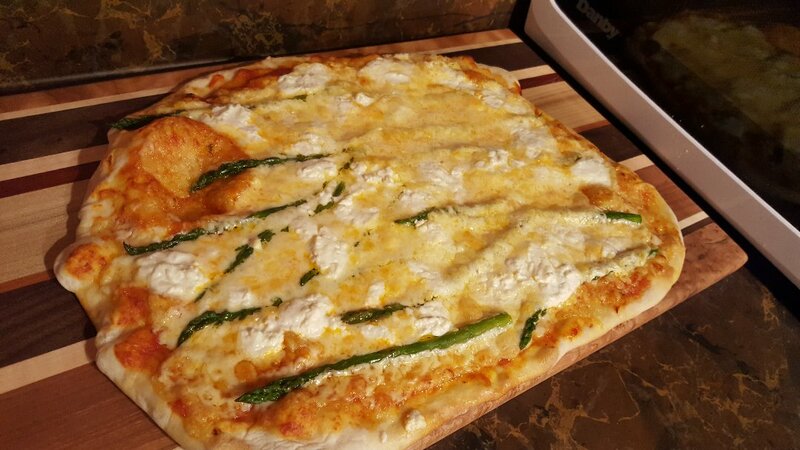 I"m behind on the freezer pizza making!